A killer balance of writing and improvising by and for people who aren't afraid of the jazz police. 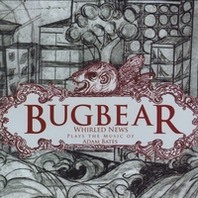 The first Whirled News release since 2001, this one features the brilliant writing of Adam "Bugbear" Bates. The band formerly known as "Whirled Jazz" has many new faces on this recording, along with frontmen Tom Bergeron and Keller Coker. The name change reflects the band's desire to escape the narrow confines of genre-think to a world of wide-ranging influences and exploration.